Roewe i6/Roewe ei6. 2016 to date (prod. n/a). 4-door sedan. F/F, 999 cm³ petrol, 999 cm³ petrol–electric hybrid (I3 DOHC), 1490 cm³ (I4 DOHC). 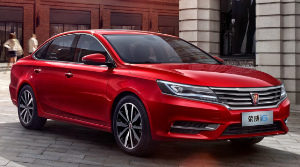 Conservative though much liked six-light compact sedan, with 1·5 four and 1·0 triple announced, but launched for public sale in 2017 with the former. Intended to replace 550. YunOS integrated into system, running 10·4-inch screen, capable of voice recognition, car camera and even automatic payment. Design not as interesting as Honda Civic (2015–) or Geely Borui, among its rivals. Smooth power delivery from 1·5; some body roll, with suspension biased toward comfort. Hybrid model dubbed ei6.